Our purpose is to conduct research in computerized image analysis and perceptualization. Our role is to develop theory and methods, algorithms and systems for applications within life science, medicine, digital humanities and other applications. CBA spreads the knowledge about and encourage the use of image processing in other research groups and in society. Read more about our work . Radial line Fourier descriptor for historical handwritten text representation (Anders Hast and Ekta Vats)Proc. 26th International Conference on Computer Graphics, Visualization and Computer Vision, 2018. Accuracy and precision of 3 intraoral scanners and accuracy of conventional impressions: A novel in vivo analysis method (Robert Nedelcu, Pontus Olsson, Ingela Nyström, Jesper Rydén, and Andreas Thor) Journal of Dentistry, volume 69, pp 110-118, ELSEVIER SCI LTD, 2018. Orbital volume and shape in Treacher Collins syndrome (Julie Levasseur, Johan Nysjö, Ronak Sandy, Jonathan A. Britto, Nicolas Garcelon, Samer Haber, Arnaud Picard, Pierre Corre, Guillaume A. Odri, and Roman H. Khonsari)Journal of Cranio-Maxillofacial Surgery, volume 46, number 2, pp 305-311, CHURCHILL LIVINGSTONE, 2018. Robots as companions in feelings and discussions (Ryoko Asai and Iordanis Kavathatzopoulos).Retfærdighed - Justice, Robophilosophy, pp 42-42, Copenhagen, 2017. Learning surrogate models of document image quality metrics for automated document image processing (Prashant Singh, Ekta Vats, and Anders Hast)Proc. 13th IAPR Workshop on Document Analysis Systems, IEEE, 2018. 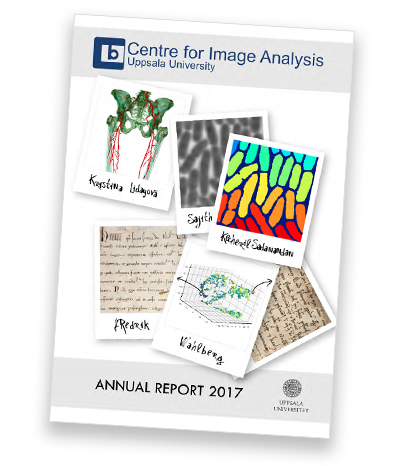 Read about our most recent research and educational activities in our annual report for 2017. Download the report here . Updated 2019-04-09 11:13:11 by Håkan Wieslander.